Ryan Browne's GOD HATES ASTRONAUTS, coming this October from Image Comics, is outrageous, raunchy, absurd, violent, extremely popular, and everything you could want in a comic. NASA hires the Power Persons 5 to keep the nation's farmers from launching themselves into space in homemade rocket ships. The bad news is that NASA is wasting their money, because this gang of hooligans is going to hang out, get drunk, have extra-marital affairs, and occasionally save the day in spite of themselves. Browne's sense of humor and relentless pop cultural onslaught caught the eye of Felicia Day, host of The Flog and creator of The Guild, who declared the comic "awesome," in addition to comics professionals like Chris Burnham (OFFICER DOWNE, Batman Incorporated), Jonathan Hickman (EAST OF WEST, Avengers), and John Layman (CHEW). They've all praised the quality of Browne's work in GOD HATES ASTRONAUTS, and his fans have been equally responsive to what's essentially a personal work. "The book comes from drawing exactly what I want to draw and then finding a logic to the story that will connect all my gags and references to superheroes and Robocop," says Browne. 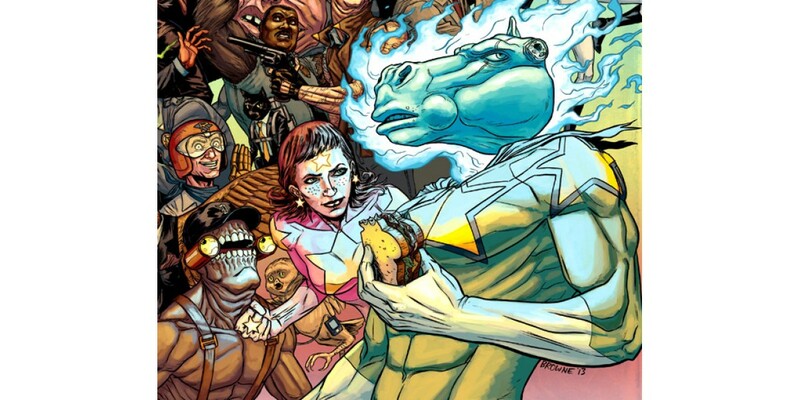 GOD HATES ASTRONAUTS began life six years ago as a comic written and drawn over the course of 24 hours, resulting in a madcap and free-wheeling pace and approach to storytelling. After that, Browne published GOD HATES ASTRONAUTS as a webcomic. Now, the softcover collection of GOD HATES ASTRONAUTS includes not just a fully remastered edition of the original webcomic, but one hundred pages of rare and all-new material not available on the web. There are 21 pin-ups from artists like Chris Burnham, Rebekah Isaacs, Tom Fowler, Mike Norton, and more. The two original 24-hour comics are included, along with a reference guide that explains the parodies and inside jokes, and 18 all-new two-page origin stories written by Browne and drawn by some of the best talent in comics, including Tradd Moore, Tim Seeley, Riley Rossmo, Tom Scioli, Nick Pitarra, C.P. Wilson III, Zander Cannon, Jenny Frison, Chris Mitten, and Hilary Barta. "The origin stories were a fun way for me to flesh out the backgrounds that were only hinted at within the first story arc," says Browne. "On top of that, I love my friends and I love forcing them to draw what I write so it was a win-win situation for me." GOD HATES ASTRONAUTS will be in stores on October 9 and is currently available to pre-order from the August issue of Previews (Diamond Code AUG130620).